Bonita Springs : 65,000 Sq Ft. Office/Warehouse Offers: secured reception entrance with 16,000 sq ft. Office, Cafeteria, 4 meeting rooms + 4 baths. 10,000 sq ft. Mezzanine with elevator, 8 bays with 12,500 sq ft 6 dock loading platform, 33 ft ceiling height includes one 1/2 ton crane, generator. Tilt - Up construction features 127 car parking plus 1250 Sq. Ft outbuilding. Single use tenant in place on triple net at $12 per sq ft. w/3% annual increases. Bonita Springs : 6.89 +- ACRES PRIME COMMERCIAL VACANT PROPERTY NEAR I-75 AT BONITA SPRINGS, FLORIDA. 5+- Acres with 330' frontage on Bonita Beach Road, 1.89 +- Acres with 295' frontage on Bonita Grande Drive. Both parcels to be sold as one unit. Property wraps around the Racetrac Gas Station on the North side of Bonita Beach Road, 3/4 of a mile East of I-75. Seller may consider terms. Property is near Publix Shopping Center. Property zoned "CC" Community Commercial and "CT" Commercial Tourist. 295,729 Square Feet of vacant property ready to be developed. Bonita Springs : Lots of possibilities for this prime commercial out parcel lot for sale or ground lease, adjacent to upscale housing communities and an area growing with residential rooftops- Bonita National Golf & Country Club broke ground on 1500 houses in 2014: Lennar plans almost 220 homes at Bonita Landings; GL Homes has over 600 home sites at Valencia Bonita. Worthington has 800 homes; Palmira has 821 homes; Hunters Ridge 558 homes; and then there is high-end Quail West/Quail Creek just to the south. Good demographics: 3 mile radius is over 31,000 people, up from 20,000 in 2012, and at 5 miles around 90,000 people, with median income over $64,000. Good traffic counts estimated at approximately 20,000-25,000 vehicles per day along Bonita Beach Road, and growing. Traffic counts are about 80,000 VPD on I-75 at the Bonita Beach Road exit #116. Bonita Springs : Outstanding opportunity to acquire a 4,160 SF multi-tenant building on a large 1.69 acre paved and fenced site in the highly desirable Bonita Springs Overlay District. The property consists of 3 separate parcels and is one of the few large sites available and has excellent re-development potential. The property has many possible ways that it can be utilized. The existing 4 unit building can be leased out as a multi-tenant investment or used by an owner occupant. The other two sites can be developed individually. The paved and fenced lots could be leased. The entire site could be redeveloped. Bonita Springs : Located in the heart of downtown Historical Bonita Springs! Property address 27790/27796 Old 41) adjacent property) is included with the purchase of this property. Not to be sold separately. See survey attached. 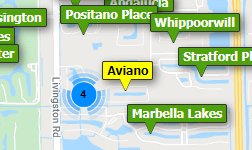 Properties are located in the Old 41 Overlay with many usages available. Bonita Springs : Located in the heart of downtown Historical Bonita Springs! Property address 10441 Packinghouse Lane(Adjacent property) is included with the purchase of this property. Not to be sold separately. See survey attached. Properties are located in the Old 41 Overlay with many usages available. Bonita Springs : Great investment opportunity! Situated on a beautiful lake in the Bernwood Business Park, this stand alone building consists of 3 large units totaling 5787 sf. plus 1,000 sf enclosed outside storage area. All units have 1280 sf of warehouse + 649' of office & bath (1 w/a shower), drive in grade level doors & 15 ft clear ceiling height. 100% tenant occupied on 1 yr. leases. Bonita Springs : Save $300,000! Build up to approximately 11,000 sqft. Building on improved parcel. Land has been cleared and filled according to development order. Engineering for parcel includes site work, fill, compaction, irrigation, drainage swales, parking area, car stops, striping, electric, water, sewer, fire-line all complete according to county required development order. This saves hundreds of thousands of dollars as all infrastructure of installed as per Lee County D.O. See remarks for breakdown of costs. Bonita Springs : Former medical office ready to be occupied. Second floor, 2,588 SF built in 2006 with 8 Exam Rooms, 6 with sinks. Reception Lobby, Billing, Nurse’s Station, Lounge and a Break Room. Bonita Springs : EXCELLENT INVESTMENT OPPORTUNITY! Established and fully rented 20 Lot Mobile Home / Trailer Park in the heart of Bonita Springs, Florida. This Adult Park has long term tenants and provides an investor exceptional cash flow! Rolling 12-month Cap Rate is 9+ with potential of 16 cap at 100% occupancy. This property basically runs on its own. City Water & Sewer and most of the tenants pay own electric. Can you say MOOO. This is a cash cow and ready to be scooped up! Note: The park is divided into two parcels and is only to be sold together. This parcel address is being sold with and in conjunction with MLS #218054206. Information and list price shown are for both parcels combined. Parcels are Contiguous. Contact Listing Agent for more details and for viewing appointments. PLEASE DO NOT DISTURB TENANTS! Non-Disclosure Confidentiality agreement required to view financial data and will be provided upon request. Bonita Springs : Fantastic location. Current owner willing to leaseback for 3 years under a triple net lease (NNN) with a 10% CAP rate. Bonita Springs : 990 sq foot End unit in a 4 unit retail condo facing Bonita Beach Road and on the south side. Collier County C-4 zoning gives an expansive list of office and retail uses. Left turn westbound into Plaza. Unit is a former established and operating Barber Shop (Hair Salon) in this location for over 20 years. Four shampoo sinks, eight cutting stations, 1 bathroom, compressor for air hose. Concrete block construction, plenty of parking out front. Sale includes the real estate, FF&E, product inventory. Bonita Springs : You've stumbled upon an excellent opportunity to own a 4.5 Star Yelp!-rated new restaurant business in Bonita Springs, FL. The location is superb and can't be denied. It is being offered fully FF&E turnkey with a transferable lease, transferable Beer & Wine License, and no outstanding debt what-so-ever. Aside from the real estate, soda machine, and a couple other items which are currently leased, you would own everything. It's all in excellent working order and fully operational. The restaurant already has a great following and is poised for more success. So, if it's so great....why are the owners selling the business? Contact us and we will disclose to you the reason behind the sale. You'll fully understand why they are selling the business. Please know that a confidential NDA will be a requirement prior to any detailed information being disclosed. Bonita Springs : What a perfect opportunity to OWN your own office instead of renting. This 1583 Square Foot (Per Lee County) office condo is in grey shell condition and ready for your custom build out. Design it for maximum efficiency, customize the layout to your specific business and you may never need to move again! Access from the central lobby (2-story building) and it also has a rear door. Great accessibility for your customers/clients/patients as this is a first floor unit, with plenty of surface parking right at the front of the building. No elevator needed to access the first floor office. In a mostly-medical office complex, but general or medical office uses are acceptable. Make this the day you quit throwing rent money DOWN THE DRAIN and make the decision to own instead of rent. Priced at under $95 per square foot, now is the time to buy before prices rise further. Bonita Springs : Listing is for 2ND floor unit 215 A&B Location, Location, Location PINE HAVEN PLAZA Office space on Bonita Beach Road Why pay rent when you can own? Competitive maintenance fees paid quarterly includes water, sewer, garbage, condo Management Company, common grounds, exterior maintenance, and condominium insurance. Must be purchased together with Unit 214 A&B shown on different MLS listing 218019182 Combination of both units 214 A&B and 215 A&B for a total of appox. 1822 sq. ft. with 7 individual rooms, Lobby area, 2 bathrooms, and 2 Air conditioning units. Units can be used for your own use or rented out for investors.Owner Will Consider Financing with 50% down.